Ever since Rissa was a baby it has been impossible to keep socks on her for very long. She used to kick them off, now she yanks them off as soon as her shoes are off. But it's not her socks that caught my attention the other day. Somedays I'd take over, slipping her shoes off her feet effortlessly. Other days I'd place her warm, sticky hands around her shoe or boots, showing her how to pull them off easier. Then there were days I couldn't put up with her flip flopping between wanting to do it all by myself! and me doing it for her. I'd insist she would have to figure it out. That she knew how or needed to learn. Inside I felt awful for making her cry over shoes that wouldn't come off. Until she freed a foot. Unfortunely, Rissa couldn't always replicate those results. We've had more tantrums over shoes than any woman should have in a lifetime. I don't even like shoes that much. I cry when buying them, not while kicking them off at home. And this year has been full of shoe kicking. 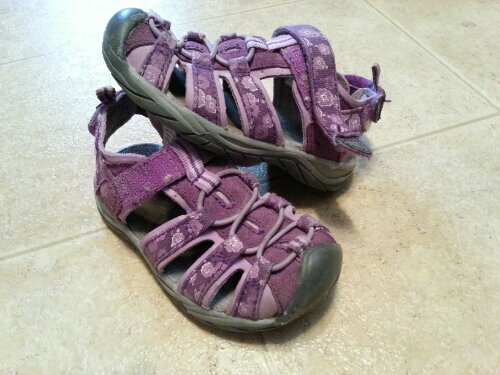 The new sandals I bought her as the weather warmed up have velcro straps. They fit her well and are easy for us to put on a wiggly toddler. For some reason, they've presented a challenge to Rissa. Her sandals last year were loose enough to slip in and out of and she could usually pop off her sneakers. But something about these, with their top strap and heel strap, caused a lot of trouble. Recently she started getting them off on her own by literally flinging her feet around after undoing the straps. Eventually they'd fly off her feet in different directions. Or she'd bang her heel against the floor until they popped off. I always knew she was taking them off because of all the noise. We returned home. Her sandals clopped along the kitchen floor as she galloped into the living room. I finished getting myself and the baby in, the stroller and unloaded the diaper bag from my back. Rissa trotted past with the quiet pitter patter of bare feet. I looked down, my throat tightening. She had taken her sandals off… effortlessly… like a big girl. These are the silent but telling milestones that sneak up on you, reminding you that they are growing up before your eyes.